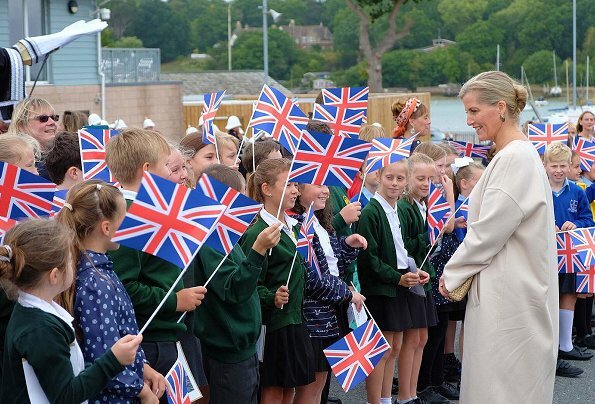 On September 21, 2018, Countess Sophie of Wessex visited the Isle of Wight, which is one of the largest isles of United Kingdom. 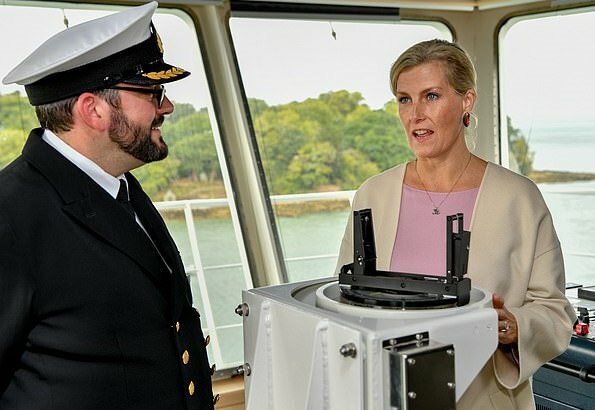 The Countess visited a charity organization, a skincare company and officially launched a new ferry. 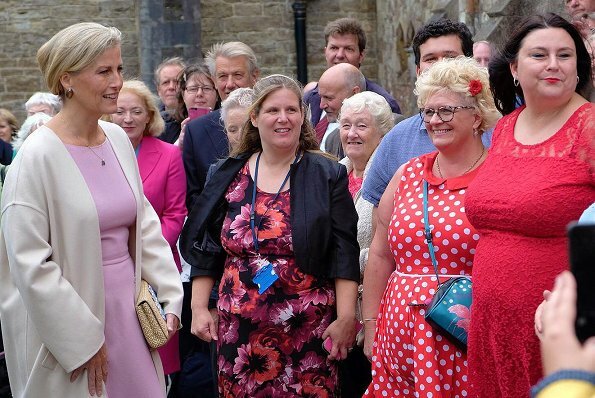 The day of the Countess of Wessex day on the Isle of Wight began at Aspire Ryde, a community charity organization that gives people from across the Island the opportunity to participate in gardening projects, a community choir and dance lessons. Starting life as a Church in 1840, the building was transformed with the help of volunteers and became a bustling community centre that serves over 1000 people a week. 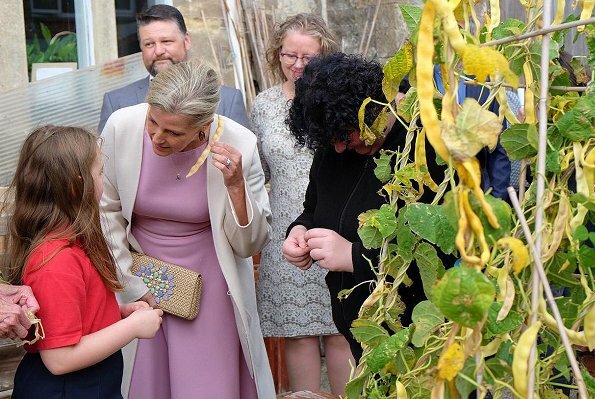 Afterwards, the Countess toured the Greenhouse factory at Liz Earle’s headquarters to discuss the skincare company’s sustainable approach to production. 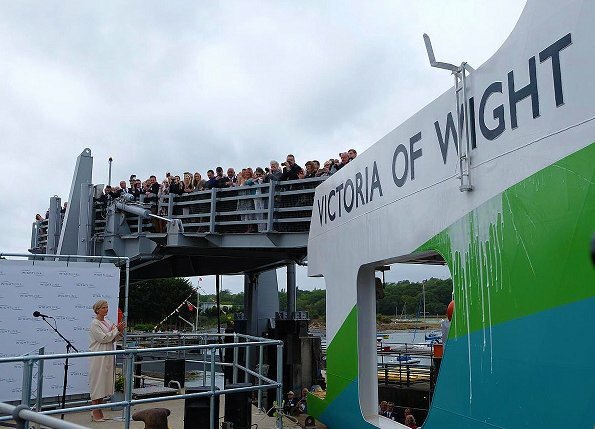 The day ended with the official launch of ‘Victoria of Wight’ which is a new ferry for the crossing between Portsmouth and Fishbourne. 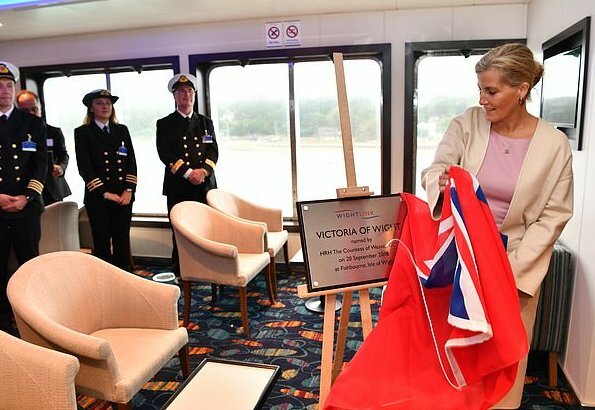 Ceremonial ship launching dates back thousands of years and the process involves numerous traditions – one of which is ‘christening’ the vessel by breaking a bottle of champagne over the bow of the ship as it is named aloud. The new ferry is environmentally friendly as it partly runs on electricity. 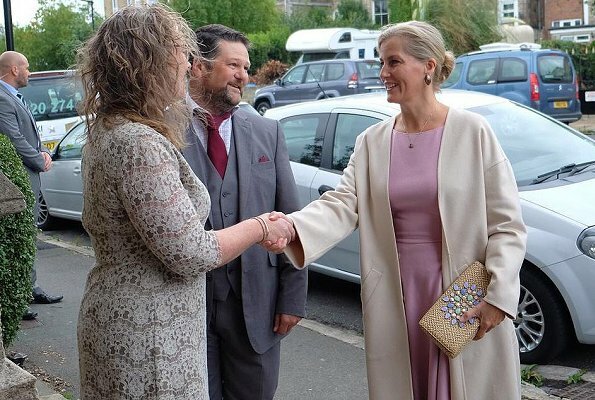 This lavendar dress reminds me one from Emilia Wickstead which Duchess of Cambridge wore last summer. what a fantastic outfit! I would love to see more of this outfit. The dress is really beautiful and the combination with this coat.. lovely! When you baptise a ship, as we Dutch call it, the lady has to wear a hat. I like this dress , its amazing but not the coat . I don’t care for the coat either, it has an odd fit to it. The dress color is beautiful. That lady in the first picture must have got caught in the wind, her hair is a mess. That coat is too big and baggy. It is an easy one to wear but reminds me of an old, favorite sweater - rather plain, nothing to distinguish it. I wish it had a closer fit. Nice dress and color, the coat seems a bit too wide. Both coat and dress are pretty and fit appropriately. Nice outfit for this occasion. We cannot see a lot of the dress but I am willing to trust you, to me the coat is quite appropriate as well. She has also a bun (or maybe there is another word to call this one), better than the one of Victoria? surely yes for Sophie, would it suit for Victoria? While I would prefer Sophie to get a stylish cut and wear her hair down, I do like this upsweep. Yes, Victoria would look better with this style because all of her hair would not be slicked back to a bun on the back of her head. This more loose sweep can be quite pretty when done right. As far the dress and coat. I, too, wish we could see more of the dress and while the coat may be a bit big I still think the overall look is nice on Sophie. Very pretty colors, also lovely elegant hair style. Duchess Sophie. Elegant, discreet, calm and appropriate. What an asset to the Royal Family.